Loose Coil - This is a common issue from devices being dropped or banged around, after a while the coil can loosen up and just need to be retightened. Over Priming - When priming a coil for the first use, if you over prime the coil you will flood the cotton which will cause leaking and spitting. Dead Coil - When your coil comes to the end of its life span the cotton on the inside has lost a lot of its absorbency. This will cause leaking and possible burnt hits. 2)Seizing/Stripping​- Most everything e-cig related threads together. You must ensure when screwing them together that you only do everything finger tight. When the two peices want to stop let them. Also ensure the threads are nice and clean as if they are not this could damage or seize the two items together. 3)Charging- When using external battery devices a lot of devices will have a charging/upgrading port on it. With single battery devices this can be used to charge your device although it will only give it a 70% charge. With multiple battery devices you must charge your batteries with a external battery charger. This will fully charge your batteries as well as it will improve the total life span of the your batteries. 4)Equipment Knowledge- A common issue for people starting out is that with everything there is a lot of new names and jargon. A lot of witch can be slowly learned over time but something you want to pay attention to is; your device name, your tank name, nicotine strength, and coil resistance (ex. 1.2 ohm or .5 ohm). 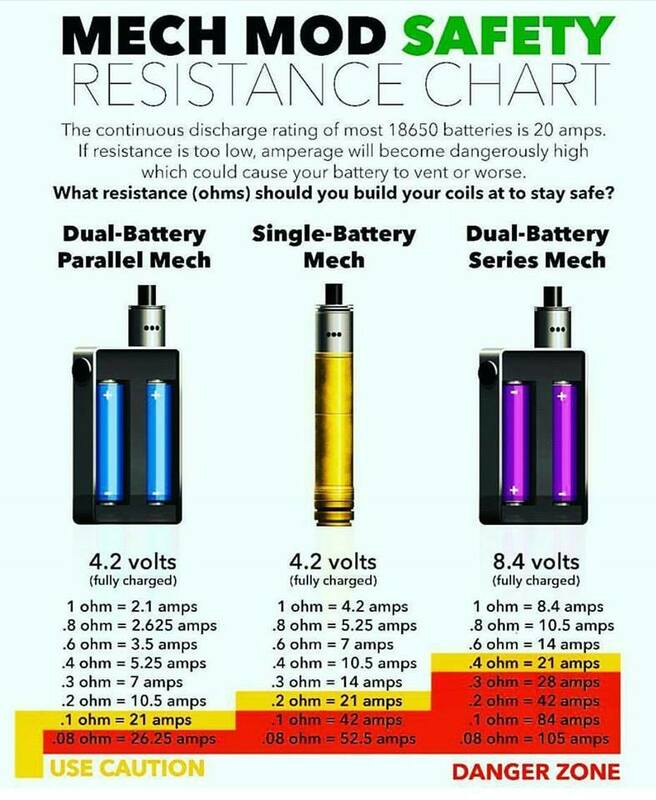 Knowing these things will allow you to get the proper replacement juice/coils to keep you vaping and smoke free. ​When using vaporizers you will most likely come across both internal and external battery devices. Using "external" battery devices gives you the ability to remove your battery when it is dead. You are then able to put a freshly charged battery in and continue vaping. Most "external" battery devices today will run on one of two battery types being; 18650 or the larger 26650. Both varying in different milliamps and amperages. These battery are much stronger then your average house hold battery and should be treated with care and proper safety measures. All batteries have a safety wrap around them. If this wrap gets damaged or torn the battery should not be used until the battery has been properly rewrapped. If batteries are dropped in anyway you should always check them for; wrap damage, dents or marks and positive pin damage (The positive pin on your batteries can be crushed, if crushed this battery can be dangerous and should not be used). When traveling with multiple batteries you want ensure that you have them in the proper traveling equipment. Which includes but is not limited to; silicone battery sleeves or plastic battery cases. This will prevent your battery from being banged around as well as keep the positive and negative ends from coming in to connection with any other metal (If both ends of a battery meet metal such as; change, keys, ect. the battery will discharge causing sparks).